It's now official! We're gonna pull off this camp - see below! - sending out mass email as well, so please try and recruit some friends. Thank you! 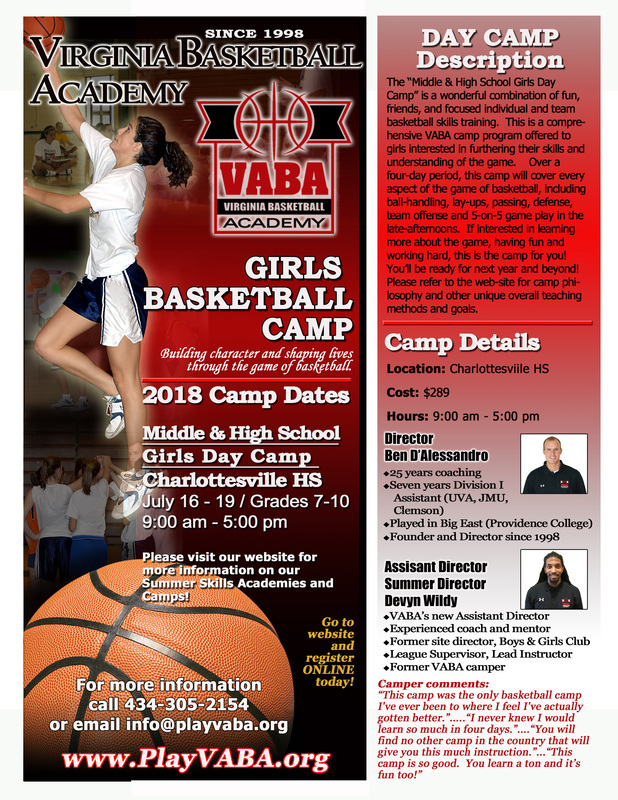 VABA Middle & High School Girls Day Camp (starts Monday, July 16)! ...great basketball camps for girls grades 7-10! THIS CAMP IS NOW OPEN FOR REGISTRATION! Click here--> to Register today! Click here--> view FAQ for Girls Day Camp (July 16-19)! VABA will be hosting its annual Middle & High School Girls Day Camp starting this Monday! See info below, and feel free to email us with questions! Learn more about VABA's "Middle & High School Girls Camp!" The summer is almost here! Click on the flyer to view Frequently Asked Questions (FAQs). This is a very fun and productive teaching camp for middle and high school girls interested in developing their basketball skills and knowledge. This a comprehensive camp with amazing coaches who teach, motivate, inspire and develop the player on all levels - from individual offensive skills, to team skills, to ball-handling, shooting and incorporating all these essentials to the critical final stage of game-play...when they really count! There is a strong character-development element to this camp as well as we attempt to prepare the ladies for life on and off the court! There is nothing more fun than experiencing the camaraderie with fellow campers and teammates and the dynamic, energetic teaching from great trainers and coaches! We are sincerely looking forward to the privilege of working with your family this summer!